(Charlottetown, P.E.I.) – The Symons Medal and Lecture Essay Contest invites Prince Edward Island students in grades 11 and 12 to submit an original and creative essay or digital piece responding to the current state of Canadian Confederation. Students may reflect upon these questions or develop their own themes within the broader Canadian Confederation subject. Students may wish to draw upon ideas presented during Dr. MacMillan’s 2018 Symons Medal Lecture, available to read or watch in video format via https://confederationcentre.com/heritage/symons-medal-and-lecture-series/. The essays will be reviewed by a panel of judges appointed by the Centre and winners will be announced in May 2018. Student contestants should submit their entry by April 30, 2019 via email to etheuerkauf@confederationcentre.com; or can be mailed to Ellen Theuerkauf, Confederation Centre of the Arts, 145 Richmond Street, Charlottetown, PE C1A 1J1. For more information, visit the Confederation Centre’s website. The Symons Medal and Lecture Series is named in honour of Professor Thomas H.B. Symons, a long-time supporter of Confederation Centre and a Board Governor. Professor Symons, the founding President of Trent University, is widely recognized for his work in the field of Canadian Studies, particularly within public policy, heritage, and education. Photo Cutline: Dr. Margaret MacMillan was the 2018 recipient of the prestigious Symons Medal from Confederation Centre of the Arts. 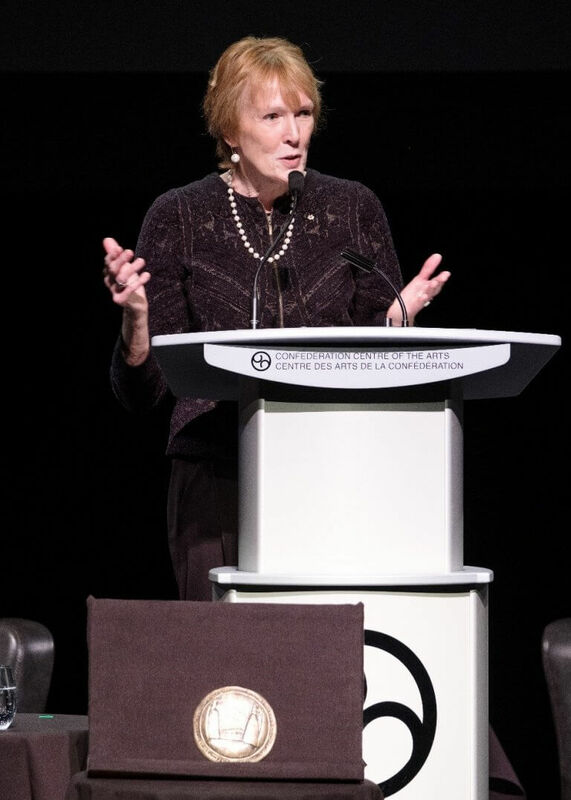 Dr. MacMillan received the Symons Medal and offered her thoughts on the current state of Canadian Confederation in a public lecture, available to read or watch via the Centre’s website (Louise Vessey image).